TAFE NSW Glendale Campus once again expresses its appreciation to Suncorp Insurance for supporting their apprenticeship and pre-apprenticeship training programs with the supply of two late model “written off” motor vehicles for the students to repair, a VE Commodore ute and a Toyota Corolla. Under the excellent guidance of Adam McDonald, Auto Body Repair teacher the students began by installing the VE Commodore on the Car-O-Liner mark 6 and measured it to ensure it was within tolerance. After the measuring was completed the car was quoted, the repair manuals sourced from Holden and their engineers were contacted to discuss the repair of the rear quarter panel or the replacement of the quarter panel or indeed the entire LH body side panel. After reviewing photographic evidence, Holden’s engineers gave permission for the quarter panel (with all inner baffles) to be replaced, with a couple of small body filled repairs to be completed on the LH front guard and LH door. The car was then given to the Automotive Refinishing apprentices to seal all joints, prime and paint the car ready for presentation to the fictional customer. This whole process took approximately one week, which also included theory lessons as well as trying to represent real time repair times. The second vehicle was a blue Toyota Corolla which was also installed on the Car-O-Liner mark 6 and measured and several different students prepared quotes on the vehicle. The front chassis rails were across and down about 10mm to the right. The chassis rails were realigned before being removed and replaced using the Toyota spec measurements. Student also replaced the radiator supports and both skirt extensions. 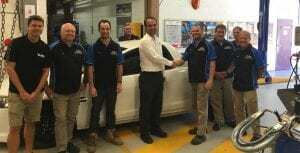 The vehicle was presented to the paint shop students to seal, prime and paint before being refitted. TAFE NSW Glendale Campus prides itself on being up-to-date with industry practices and conducting quality training and assessment – not just a tick-and-flick RTO. With the industry experiencing a major shortage in skilled technicians, the dedicated staff plays its part in assisting the industry with training their apprentices, although this would not be possible without sponsors such as Suncorp. There is also a pre-apprenticeship program running every six months with two days at TAFE and two days in a smash repair workshop to give the students a taste of what the industry is all about. It also gives the prospective employer a chance to assess the young person’s skills, commitment and potential to fit within their apprenticeship program. Suncorp also sponsors the institute awards and Glendale’s Try-a-Skill Trailer which is used at high school career events to introduce prospective young school leavers to the prospect of becoming an apprentice in the industry. With the fast-moving repair trends in the industry one of the ways the Glendale teachers keep up-to-date is by doing I-CAR training and becoming I-CAR approved trainers, which in turn has developed into a balance of TAFE and I-CAR delivered training being taught at Glendale. This will contribute to the apprentice becoming a Platinum Level I-CAR young trades person. This program will ramp up in 2018 for all of Glendale’s apprentices and is in line with Suncorp’s industry approach to having their technicians and workshops I-CAR trained and up-to-date with the latest industry trends. Recalibration – are you really doing it right?